Ideas • Encourage your child to count along as they click the dots. Having a set of numbers in order might help them decide which number comes next. • Predict what the picture will be before you start. • Predict again when about halfway through. • Predict again just before you finish. 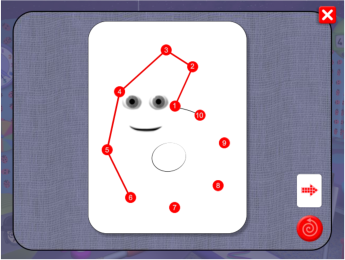 The Join the Dots Game On the screen The Join the Dots game encourages children to count in order, recognise numerals and to look closely and predict. Click the dots in order starting at 1 to complete the picture. When the dots are completed, the picture will be revealed. The dotted arrow moves to another picture. The swirly arrow resets the screen.